Pablo Menéndez is no stranger to the cutting edge of music in Cuba - his involvement in it runs as far back as his work in the seminal group GES (Grupo Experimentación Sonora del ICAIC) in the 1970s. However, he built his international reputation as an artist in the Fusion genre with his group Mezcla, and until recently, there weren't that many opportunities to hear him in full Jazz mode. In this recording, he assembles a special group of some of Cuba's best but lesser-known Jazz artists, many of who also lead their own groups, and the result is music that moves far beyond the boundaries that exist in past Mezcla recordings. Todos Estrellas Del Jazz Cubano is a live concert DVD of a August 2012 performance at the Teatro Nacional de Cuba (Sala Covarrubias). This writer had the privilege of attending the DVD release concert at the Teatro Cine 23 y 12 on December 18, 2013 in Havana, Cuba, and this DVD was shown on the theater screen prior to a live concert. The opening track, Hijos de la Mezcla, begins with a batá sequence by percussion master Octavio Rodríguez, one of the first musicians to play all three of the batá drums together. Mezcla has recorded this piece in the past, but this rendition is more of a true Jazz treatment including extended keyboard solos and some saxophone lines from Orlando Sanchez that approach Free Jazz. The ending by the ensemble underscores the fact that this is a very different Mezcla at work. Big Brecker is a tribute to saxophonist Michael Brecker with an opening section by Orlando Sánchez that this writer would not hesitate to use as Exhibit A to shatter any misconceptions about stylistic limitations on Jazz in Cuba. This seques into a fusion of Cuban rhythms and a melodic tribute to the music of the Brecker Brothers band. El médico de los pianos could be described as a Jazz Rock Danzón. Trumpeter Mayquel González stands out in this track, and those who love BeBop should also love this track. Ruy López-Nussa takes an excellent solo on drums here as well. I'll See You In Cuba is an Irving Berlin number (sung in English) that stays mostly faithful to the original 1920s style of the song. ¿Quién Tiene Ritmo? by Benjamin Lapidus opens with a quote from I've Got Rhythm and builds into a descarga evocative of Emiliano Salvador's contributions to the genre. Pianist Alexis Bosch also has his own group and will be worth following in the future. The explosive Homenaje a Afrocuba is a tribute to the legendary Cuban Jazz band Afrocuba, and it carries all of the energy, variety and excitement of the best work of that group. A highlight of this track is an intense exchange between Mayquel González and Roberto García on flugelhorns. Suzi's Mood brings Jazz violinist William Roblejo to the stage, and Pablo also contributes some wonderful solo guitar here. Orlando Sánchez adds a stunning saxophone solo. Chucho's Blues features the group in Jazz Rock mode, and Chicoy's Blues gives Pablo an opportunity to wail on guitar before changing to another Jazz Rock piece that would appeal to fans of legendary US groups like Chase. Rumba a Puertas Abiertas is an incendiary descarga, and the final track, Cuando Se Vaya La Luz Mi Negra, is a Blues worthy of what we enjoy in this writer's city, Chicago. 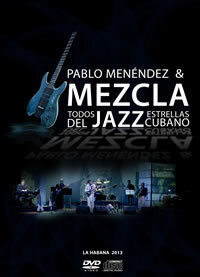 If you think you know everything there is to know about Pablo Menéndez from his past recordings with Mezcla, think again - this intense Jazz DVD not only shows sides of him that you may not know, but it will radically change your perceptions of the current Jazz scene in Cuba as well. Hopefully, it will also send you in search of the other groups represented by the musicans in this project. Things are evolving rapidly there, and a LOT of revelations await those who make the effort.